Almost everyone experiences a breakout now and then, and we all know what a bummer pimples can be. Now, we have clinical proof that acne can cause the blues. Last month, a study in the British Journal of Dermatology established a scientific link between acne and depression. 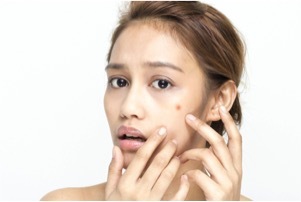 After following thousands of people with and without acne for 15 years, the study revealed that acne sufferers were more likely to suffer from depression, particularly in the first year of onset. While researchers aren’t certain why acne increases depression risk, we do know something even more important for acne sufferers—how to improve problem skin and decrease breakouts! Clear, radiant skin is more accessible than ever before, thanks to effective technology and skin care treatments. …Dr. Jeff Alexander and his expert nurses can help improve the overall health and clarity of your skin with a variety of topical treatments, including retinoid creams. Retinols are derived from vitamin A, one of the most powerful vitamins in skin care that is clinically proven to strengthen skin and speed cellular turnover, reducing breakouts. Retinol can also help improve the overall tone and texture of your skin, diminishing fine lines and wrinkles, so it’s an anti-aging treatment to boot! …such as comedonal and pustular acne—which are not always responsive to topical medications—we offer FDA-approved Isolaz™ Laser Acne Therapy. This painless treatment penetrates the skin with laser energy to drain pores from the inside, destroy acne-causing bacteria and suction away impurities. Isolaz provides immediate benefits by flattening and drying pimples. It also offers long-term improvements, decreasing the number and severity of breakouts while diminishing a wide range of skin concerns, including brown and red spots, oiliness, broken capillaries, skin discoloration, large pore size, uneven skin tone and rough texture. … that have a knack for popping up before big events, we can help reduce swelling and speed healing with Kenalog injections. A Kenalog shot contains triamcinolone, a corticosteroid hormone used to decrease your body’s immune response for a variety of allergies. Better skin is easier to achieve than you think! To learn more about acne treatments, schedule a consultation by calling 918.948.9639 or clicking here today.